Iron Knob is located 68 kilometres Southwest of Port Augusta, and 90 kilometres East of Kimba. 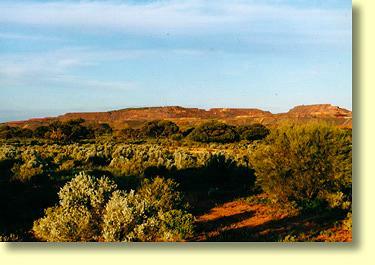 Europeans first ventured into the remote Iron Knob area during Edward John Eyre's expedition of 1839. Somewhat predicting future developments Eyre reported the discovery of vast "Iron Stone" hills. Permanent settlement of the area had to wait another 25 years. In 1854 James Patten was granted a pastoral and grazing lease over Corunna Hill, 7 kilometres North East of present day Iron Knob. The year 1880 saw a Caltowie wheat buyer named Ernst Siekman supplying large quantities of flour to the rapidly burgeoning lead, silver and zinc mining community at Broken Hill. Aware of the possibilities of new mining ventures Ernst Siekman, his wife and other family members pegged out a lease at Iron Knob. In doing so the Siekman family's Mount Minden Mining Company was born and the company extracted Iron Ore from the area for the next 16 years. Ernst Siekman and his family were of Prussian descent, and the name of the Mount Minden mining company reflected the fact that Ernst Siekman's birthplace was in Minden - a town within Westphalia province. 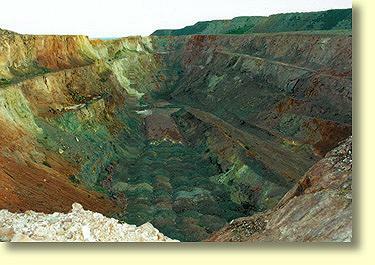 In many ways the Mount Minden mining company was a pioneer in the development of a modern Australian iron ore mining industry, and by the standards of the day Iron Knob's ore deposits were rich pickings indeed, often obtaining metallic purities close to 70%. From 1899 BHP worked the mining lease at Iron Knob for the next 100 years. And one hundred years of mining has certainly left its mark - with the height of Iron Knob Hill being reduced by more than 150 metres. For the traveller Iron Knob may not be the most scenic of towns, but it certainly is a town of historic significance. Iron Knob played a crucial role in the birth of Australia's commercial Steel making industry at nearby Whyalla. For those of you with a keen interest in mining history Iron Knob may well be worth a rest stop and visit for a couple of hours. Iron Knob is a small settlement with basic facilities for the traveller. On the edge of the town is a Roadhouse. Travellers should be aware this Roadhouse is not open 24 hours a day. To the west the next 24 hour Roadhouse is in Ceduna, and to the North East the next 7/24 Roadhouse is Port Augusta. Located by the Iron Knob Roadhouse is Motel Accommodation. Iron Knob also has a general store and Post Office facilities situated on the main street - don't worry you won't get lost! The Iron Knob Community Tourist centre also provides information and advice to the traveller although opening hours may vary. Situated between Iron Knob and Port Augusta is Pandurra Station which has Motel and camping accommodation. The Iron Knob Tourist centre has a display of items relating to the mining history of the area. For those of you with a geology bent there is also an interesting display of mineralogical specimens. Apparently tours of the mining site are also possible. Please check with the Iron Knob Motel Roadhouse by telephoning (08) 8646 2058, or contacting the Tourist Information Centre on (08) 8646 2129. To the Northwest of Iron Knob is the Gawler Ranges wilderness. The roads in this area are poorly maintained, and from the travellers point of view this area is really only suitable for reliable 4 wheel drive vehicles. At all times it is recommended travellers should observe the usual precautions when travelling in the Outback. Take a reliable vehicle and plenty of food and water. Drive at slow speeds - especially if you are unfamiliar with these roads. Within the Gawler Ranges camping is permitted within 30 metres of public roads. If you are travelling from Iron Knob To Ceduna and points west - or vice versa - there is an alternative route that passes through The Gawler Ranges from Iron Knob to Wirrulla. Basic accommodation is also available at Mount Ive station for those of you who wish to spend some time in this unique area. The Iron Knob Roadhouse should be able to advise you of road conditions and hazards in this area.